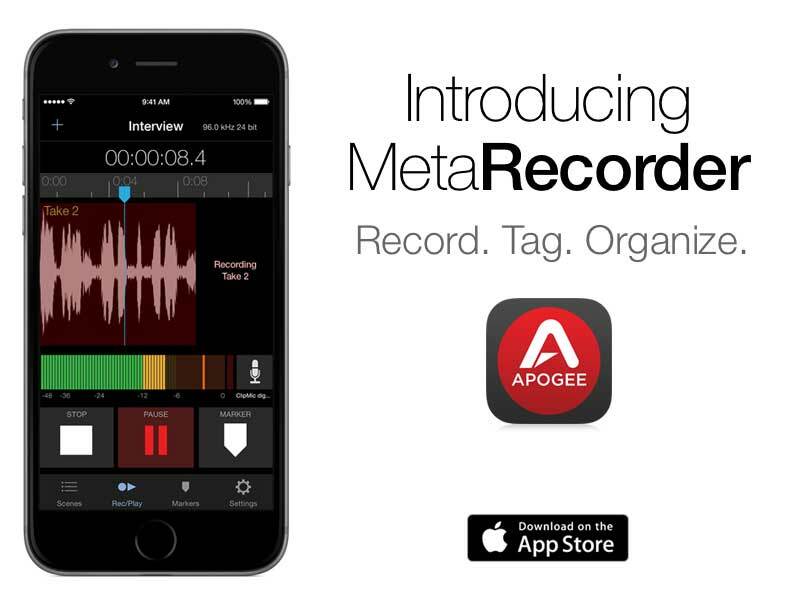 Santa Monica, California, April 14, 2015 – Apogee Electronics, industry leader in digital audio recording technology since 1985, is pleased to introduce MetaRecorder, a two-channel audio recording App for iPhone, iPad and iPod touch that will revolutionize mobile audio production for video. Apogee’s MetaRecorder is the first audio recording app for iPhone to offer intuitive multi-take recording, tagging and file organization for any field recording scenario. The perfect companion to Sennheiser’s digital clip-on microphones powered by Apogee, MetaRecorder features 24 bit/96kHz recording quality plus software control of input level and recording presets. Essential features of MetaRecorder on iPhone can be controlled from Apple Watch – start and stop recording, Favorite a Take, add Markers or set your microphone input level. Apply metadata tags like Keywords, Favorites, Markers and more to your audio files while recording in the field, then share the recorded audio and Final Cut Pro XML files to Dropbox directly from MetaRecorder. When imported into Final Cut Pro on a Mac, the captured metadata simplifies the process of organizing and parsing your media, substantially accelerating your post-production workflow. MetaRecorder for iPhone is a free download from the Apple App store. For a limited time, connecting a compatible Apogee or Sennheiser device (see list below) permanently unlocks unlimited continuous recording. MetaRecorder also works with the built-in microphone or any other iOS compatible device but is limited to 60 seconds of continuous recording. An in-app upgrade can be purchased for $4.99 USD to unlock continuous recording. The MetaRecorder Apple Watch App will be available as an update to the MetaRecorder app for iPhone, or via the Apple Watch App Store, beginning April 24.